Ten-year-old Nate is a good kid, but he has some challenges in his life. His older sister torments him constantly. He's starving because his mom can't cook. And he hates recess because he'd rather sit in the classroom and draw cartoons than play sports outside. 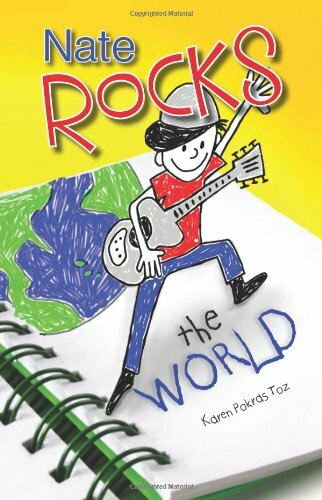 In Nate Rocks the World, Karen Pokras Toz introduces us to Nate in a fun, adventurous way. In general, we follow Nate through some pretty typical fourth-grade activities: a science project with an annoying partner, Halloween, Christmas. But Toz makes the story much more interesting as she interweaves Nate's adventurous daydreams into the day-to-day activities. In his mind, he rescues a dog from a house fire and helps a superhero save the world, among other crazy things! Nate Rocks the World is a lot of fun and I think it would appeal to kids in elementary and early middle school. C hasn't read it yet, but he wants to and I'm sure he'll enjoy it. This is the first in a series, so I look forward to reading more about Nate in the future! This review was written based on a copy of Nate Rocks the World that I received from the author in exchange for an honest review.